When I was a new mom, I attended a parenting group where the father next to me mentioned putting aside $130 per month in his daughter's 529 college savings account. At the time, I had just opened my baby son's 529 account with a check from his grandparents, but it hadn't occurred to me to do a monthly transfer. I checked our finances to make sure we could spare $130 per month, and set up an automatic transfer. It's been over seven years, and that monthly transfer is still going strong. When my younger son was born, we figured out a way to afford transferring $130 per month to his 529 account, too. I'm sure the man I was sitting next to had no idea his throwaway remark would have such a profound effect on my kids' college savings accounts, but this experience proved that wanting to "keep up with the Joneses" can often be a good financial decision. I wanted to keep pace with another parent, so I worked to make sure my savings rate matched his. 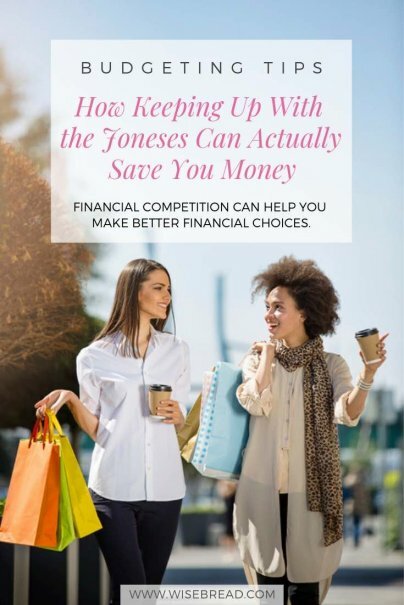 Though keeping up with the Joneses often gets a bad rap, this sort of financial competition can help you save money and make better financial choices. Here's how to make it work for you. Part of the reason why the spending habits of others can be such a powerful trigger for financial decisions — both good and bad — is because of a cognitive bias known as anchoring. This quirk causes us to latch onto a the first number or price point we hear as the "normal" price for something. For example, in the case of my 529 contributions, hearing the other parent say he puts aside $130 per month anchored that amount in my mind as an appropriate monthly contribution. Had he said that he put aside $30 or $350 per month instead, my anchoring bias would have latched onto those numbers as the contribution amount to strive for. So if hearing others talk about how they save or spend money can give you a sense of what is normal or reasonable, here are two ways to make sure you're getting comparisons that will help, rather than hurt, your bottom line. The website Status Money allows you to see how your finances compare with those of your peers, anonymously. This can help you understand which budget categories you're overspending on based on what is considered average, rather than based on any one individual. While a friend or family member can throw your sense of what's appropriate to spend out of whack, seeing what's average among all of your peers can give you much more clarity. We all have friends who spend money like it's going out of style, and it's easy to feel like you need to keep up. And then there are friends who seem to egg you on to make purchases you don't need. While there's nothing wrong with staying friends with these sorts of high rollers, it's important to recognize the effect they have on your budget, and make plans accordingly. Plan on seeing spendy friends in environments where you can't spend money — like at dinner parties or on nature hikes — so that the temptation to keep up is removed entirely. Keeping up with the Joneses is a problem if you're simply trying to save face in a spending competition. But knowing exactly how much people save or how little they spend can give you a helpful metric for managing your own finances. The trick is to recognize when to use the example of the Joneses, and when to ignore it. Former educator and author of three personal finance books.